Over the years, our team has seen many of our clients invest significant time and energy into their strategy launch. We’ve consistently seen our clients cultivate positive relationships with media partners, government officials, institutions and corporations in the effort of successfully marketing their community economic and development strategies. Communities such as Des Moines, who since 2011 has partnered with top leaders in the Central Iowa region on their Capital Crossroads initiative, have had highly successful campaigns. In 2010, Birmingham launched a comprehensive five-year economic development strategy by the name of Blueprint Birmingham. Other communities like Watertown, South Dakota have been praised by their local media for their H20-20 visioning process. Their initiative has been recognized as “perhaps the most intensive citizen-driven effort ever developed in South Dakota” by the Watertown Public Opinion newspaper. Market Street’s recently completed process in Topeka, Kansas has also received great coverage from the local newspaper, The Topeka Capital-Journal. 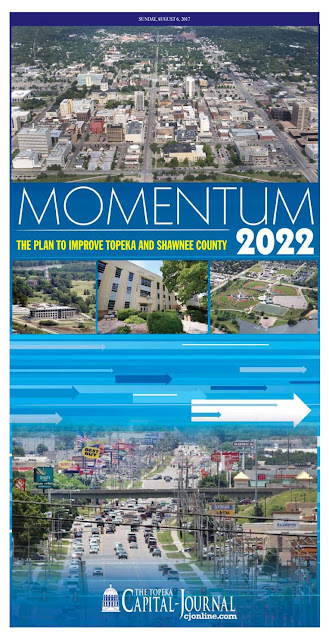 But on Sunday August 6, the community and the newspaper took things to the next level with an outstanding 30-page special section that highlights the community’s Momentum 2022 strategy and the programs, initiatives, and people that will work to make Topeka-Shawnee County a more successful and prosperous place. The strength of the Momentum 2022 strategy and the media coverage can be attributed to visionary community and staff leadership. A volunteer Steering Committee chaired by Shawnee County Commissioner Shelly Buhler, Topeka Mayor Larry Wolgast, and Bartlett & West CEO Keith Warta. The Committee was comprised of dynamic leaders from the public, private, and nonprofit sectors, including the publisher of The Topeka Capital-Journal, Zach Ahrens. With the aid of his team, Matt Pivarnik, who is the President and CEO of the Topeka Chamber and Go Topeka, has worked closely and tirelessly with The Topeka Capital-Journal and others to ensure that Momentum 2022 is well-publicized as the blueprint for the community’s future. Based on this coverage we would say they are well on their way! Nuclear Energy: A Crystal Ball into the Future Talent Shortage? Nuclear energy has always been a thing of fascination for me. Growing up, my father, who makes sure communities across the Southeast can safely evacuate their population in case of a nuclear meltdown like Fukushima, would casually tell us what went wrong at Chernobyl or Three Mile Island around the dinner table. This lecture also came with a basic lesson in the intricacies of nuclear power generation. So, whenever I come across any headline with “nuclear” in the title it is an automatic must read. Yesterday this title popped up on my newsfeed: “South Carolina May Spend 60 Years Paying for Nukes Never Built.” An odd headline since just a few years ago pundits were claiming that a “nuclear renaissance” was soon to occur in the United States. What happened to the nascent renaissance? A combination of factors prevented it from becoming more than a declarative statement. The rise of cheap natural gas and cost-competitive clean energy technologies like wind and solar are two primary reasons. Both have called into question the high front-end and continuing operational costs of nuclear power. But the decline of the nuclear power industry in the United States is further compounded by another important period in American history: Three Mile Island. As a result of the partial meltdown, Three Mile Island put a halt to nuclear power plant construction and when it kicked back into gear, new construction faced immense public opposition. As a result, the technical expertise developed during the post-war “Atoms for Peace” movement subsided as new construction of nuclear power plants came to a virtual standstill. Flash forward to today and the results of curtailed talent development within the industry is taking its toll. According to the article, Scana Corporation and Santee Cooper decided to mothball the V.C. Summer project – an AP1000 nuclear power plant designed by Westinghouse. Westinghouse, a Toshiba company, declared bankruptcy in 2017 due, in part, because the company’s newly designed AP1000 reactor had never been built before. The newness of the design and understandable regulatory hurdles led to cost overruns. But a lack of talent was also cited as a key concern as stated by the New York Times, “Not only was the design new, but, because nuclear construction had been dormant for so long, American companies also lacked the equipment and expertise needed to make some of the biggest components and construct the projects.” This statement in March 29, 2017 came just six years after the Nuclear Energy Institute – an industry trade group – warned that more than a third of the nuclear industry’s workforce could retire by 2016. The Institute projected that 25,000 skilled nuclear industry workers would be needed to sustain and grow the sector by 2015. 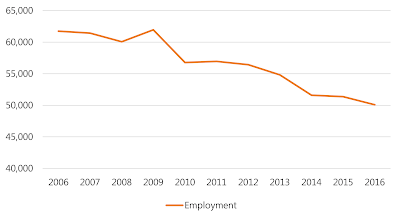 Indeed, looking at employment figures for the nuclear electric power generation (NAICS 221113) sector reveals that retirements along with utilities decommissioning outdated plants have had an impact on total employment within the sector. 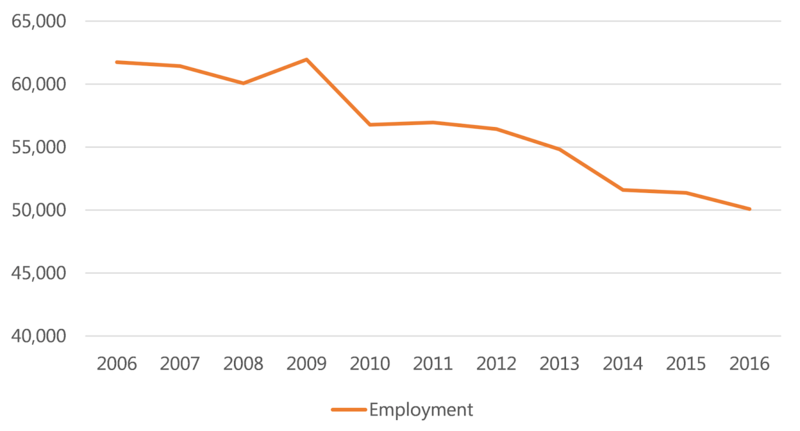 From 2006 to 2016, employment within the nuclear power generation sector declined by 18.9 percent. In 2016, there were 12,000 fewer nuclear power generation jobs compared to 2006. This data is likely a conservative estimate since it does not account for construction and engineering jobs attached to building and designing nuclear power plants. Nuclear energy looks to be in a precarious position in the United States. With only one new plant under construction, the nuclear renaissance predicted some years ago is not likely to materialize. In the big picture, one wonders whether nuclear power is a figurative canary in the coal mine for other business sectors soon to be impacted by Baby Boom retirements. Compounded with under-investment, workforce sustainability issues could undermine the health and wellness of entire sectors of the economy. Simply put, a lack of technical expertise, skilled talent, and knowledge exchange between new and retiring workers were contributing factors to cost overruns in new nuclear plant construction – today’s U.S. nuclear energy sector simply didn’t have the experience and know-how needed to foresee engineering and construction challenges or proactively deal with them in a cost-effective manner when they arose. This is an unsettling lesson nuclear energy in the United States has to offer to other business sectors throughout the economy. Underinvested talent development combined with baby boom retirements can hasten creative destruction, eliminating entire business sectors at worst and significantly curtailing their growth at best. Doan, Lynn and Chediak, Mark. “South Carolina May Spend 60 Years Paying for Nukes Never Built.” Bloomberg. August 1st, 2017. Cardwell, Diane and Soble, Jonathan. “Westinghouse Files for Bankruptcy, in Blow to Nuclear Power.” New York Times. March 29th, 2017. Nuclear Energy Institute. “Help Wanted 25,000 Skilled Workers.” Summer 2011.